Square skirting board is one of our best selling products, as it deals a plain appearance that will suit any design scheme. The simplicity of Square is its greatest feature, which prevents it drawing attention away from other room features. Its simplicity also makes for easy installation and painting. As it does not feature any detail that requires moulding, Square is the most economical product available and should be considered if budgets are tight. -- Please Select --50mm/Ex 2" 69mm/Ex 3" 96mm/Ex 4" 121mm/Ex 5" 146mm/Ex 6" 171mm/Ex 7" 196mm/Ex 8" 221mm/Ex 9" 50mm/Ex 2" 69mm/Ex 3" 96mm/Ex 4" 121mm/Ex 5" 146mm/Ex 6" 171mm/Ex 7" 196mm/Ex 8" 221mm/Ex 9" 246mm/E 10" 271mm/Ex 11" 296mm/Ex 12" 50mm/Ex 2" 69mm/Ex 3" 96mm/Ex 4" 121mm/Ex 5" 146mm/Ex 6" 171mm/Ex 7" 196mm/Ex 8" 221mm/Ex9" 246mm/E 10" 271mm/Ex 11" 296mm/Ex 12" 50mm/Ex 2" 69mm/Ex 3" 96mm/Ex 4" 121mm/Ex 5" 146mm/Ex 6" 171mm/Ex 7" 196mm/Ex 8" 221mm/Ex9" 246mm/E 10" 271mm/Ex 11" 296mm/Ex 12" 69mm/Ex 3" 96mm/Ex 4" 121mm/Ex 5" 146mm/Ex 6" 171mm/Ex 7" 196mm/Ex 8" 221mm/Ex9"
Our Square skirting board is made of a high density, moisture resistant (MR) MDF. 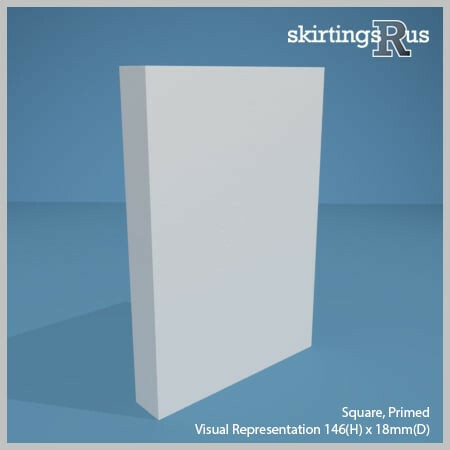 Square MDF skirting board is available in a variety of set dimensions. Please allow 100mm on each end of the length for transit damage and cutting. We can also offer bespoke skirting board heights at no extra cost. Depth – Available in 15mm, 318mm and 25mm thickneses. Square skirting boards can have a space machined out of the back of the board, allowing cables to be run and hidden behind it. Our Square MDF skirting board is produced in house in our midlands based factory and is machined to order from the specification options above. If you can’t see what you’re looking for, then you should know we can cut to any size and undertake bespoke requests. For more information visit our bespoke page or feel free to give us a call!